We offer a wide range of Mixing Units that is manufactured using quality brass, stainless steel and aluminum; along with these we also provide industrial blenders, ribbon blender machine and double mixing plant. Our range of mixing units is available in various shapes and sizes, based on cutting-edge technology that is at low operating cost. These mixing units can be customized as per the requirements of the client. To ensure the quality at par with international standard our entire range is thoroughly checked at every stage of production. Ribbon Blender Machines are mostly used in different industries like pharmaceuticals, processing plants, and food and plastic that helps in mixing powders and pastes. 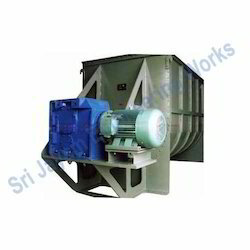 Our clients can avail from us a wide range of ribbon blender machines that is manufactured using latest methodology. These are appreciated for their durability, accurate dimensions and high tensile strength. Our range is also available in various specifications, which can be personalized as per the requirement of our clients. These products find huge demand in the industry for the following features. Wide range of models to choose from Customized designs also available. In ribbon blender, inner and outer helical ribbons are accurately proportioned and oppositely pitched to prevent localized material accumulation. Optional drive with chain and sprocket and optional vacuum service design also available. Looking for Mixing Units ?